Have you ever wanted to learn to crochet with crochet thread? How about learning to crochet doilies? I’m a huge advocate for crocheting with thread. I really love thread crochet and I know some of you do, too. In previous blog posts, I told you about the online class I have with Annie’s called “Crocheting with Thread” and my experience going to Berne, Indiana in January to film the class. But did you know that I now have a short online class with Annie’s called “Beginner’s First Doily”? 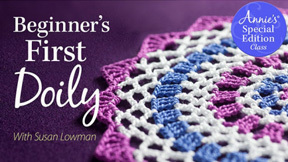 It’s a mini class to teach you how to make a beginning doily. 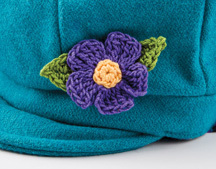 This mini class is excerpted from the full-length class on “Crocheting with Thread” and it’s a great way to get your feet wet with online classes. The cost of this mini class is only $4.95. What a bargain!!! If you sign up for this class and decide to take the full length class later on, you’ll get $5 off of the full length class. To read all about this mini class and to get started on crocheting your first doily, just click on the “Crocheting with Thread” class link on the right-hand edge of this page (it’s also on many other pages of my website). It will take you directly to the online videos on the Annie’s website. 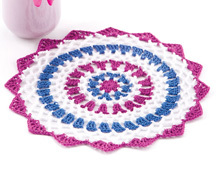 This doily is made with size 10 crochet thread, but you could make a larger doily with size 3 or 5 crochet thread, if you’d like. All of the projects in the full-length class are made with either size 10 or size 5 cotton crochet thread and a size 7 (1.65mm) or a size 0 (3.25mm) steel crochet hook. Since size 3 and size 5 crochet threads are so close in size, you can easily substitute size 3 for the projects in the class that are worked in size 5. There are 2 bookmarks. 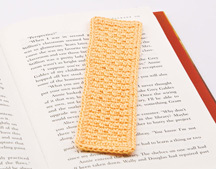 One is a seed stitch bookmark and the other is a V-stitch bookmark. They’re both beginner/easy projects to get you started with thread crochet. 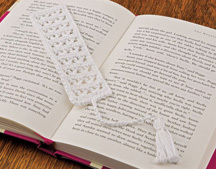 I demonstrate working the rows and the edging on these projects in the video, as well as how to make the tassel in the V-stitch bookmark project. This is the flower pin. If you’ve never worked a crochet project in rounds, this is an easy project to learn how to crochet in rounds. 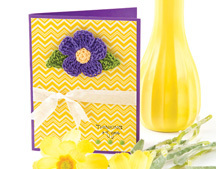 The folks at Annie’s even used this flower to decorate a handmade card! I think the card is very pretty! The instructions for the card are included in the class handout, as well. Here’s the towel edging that I designed for the thread class. It can be made with 2 edges of shells (shown in the green edging) or with only 1 edge of shells (shown in the turquoise edging). You can use size 10, 5 or 3 thread for the edging. I’ve woven some ribbon through one of the rows of the edging for added visual interest. 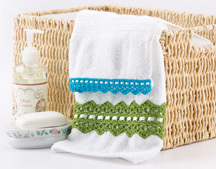 A towel with a crochet edging such as this would make a great gift any time of the year! 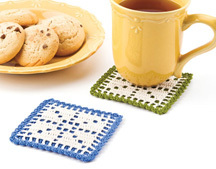 The class also includes a filet crochet coaster project. If you’ve never done filet crochet before, I’ll teach you how to read a filet crochet chart in the class. A filet crochet chart is almost always included in filet crochet patterns to help shorten the pattern and to make it easier to follow “visually”. I’ll take you step-by-step with this coaster, teaching you how to work the open and closed mesh in filet crochet. The coaster has an edging and 2 layers for added absorbency! What thread crochet class would be complete without some crochet jewelry? The necklace and earrings in this class are worked in the round with size 10 thread. The necklace has 2 crocheted “chains” for more strength when it’s worn. 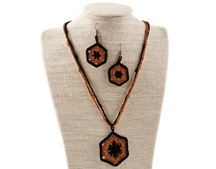 You can make this thread crochet jewelry set in any desired colors to coordinate with your favorite outfit! Each of the 7 projects in the full-length class includes a symbol chart for all of the “visual” people out there! If you’re not familiar with symbol crochet charts, you’ll LOVE them! They are a visual representation of the project itself, showing what stitches are worked in the project and where each stitch is worked. I love symbol crochet charts and I think you will, too! I really enjoy taking crochet classes to expand my crochet knowledge and skills. Whether I take an online class or an “in-person” class, they’re all very enjoyable and I learn a lot from them! And I love to teach crochet classes, as well. I hope you’re continually learning new crochet skills and techniques to challenge yourself, too. Please check out both of my thread crochet classes and all of the other fantastic online classes by many talented teachers on the Annie’s website. 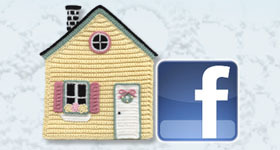 There’s a lot more that we can all learn about crochet and Annie’s has been in the crochet industry for decades! This entry was posted in Crochet videos, Thread crochet and tagged classes, crochet, crochet class, crochet video, teaching, thread crochet. Bookmark the permalink.